Do you ever wonder why most people say “sales and marketing” in that order? When referring to the growth centre of their business it is typically sales first and then marketing, rather than marketing and then sales. Yet the logical chronological order for these two disciplines is for marketing to create awareness and consideration and then sales to develop the relationship and convert the sale. As a business owner and a marketer I am acutely aware of this distinction as my colleagues and peers who refer to sales first invariably place sales at the forefront of their business growth strategy. This is not unusual as in many business-to-business (B2B) companies sales actually leads marketing. In these companies sales generates leads, qualifies them, gets the sales and develops the relationship to deliver more sales. Meanwhile marketing is largely there to support sales, creating sales kits, organising trade presenters, organising events and developing the advertising that supports the sponsorship deals negotiated by sales and management. It is why in these organisations the marketing department is often referred to as the colouring in department because largely they play no strategic or performance role beyond organising the production of the sales support materials and advertising. This is particularly evident in professional services companies such as law firms and accounting firms, where the partners drive sales through their ‘sales’ roles of business building through their personal and professional relationships. In this case when the firm gets to a size that justifies a marketing function then the role of marketing is simply to support the partners’ relationship building and perhaps create a consistent professional presentation framework that passes as ‘branding’. 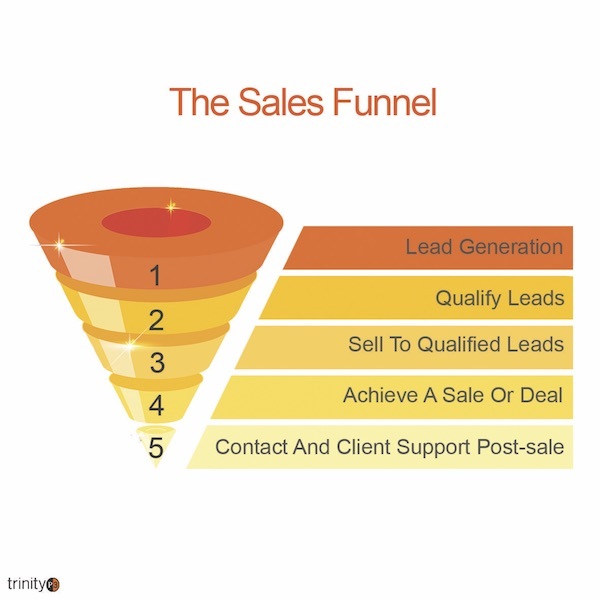 But why are B2B companies so often sales led? To understand this phenomenon, you simply need to observe how B2B companies grow. Companies that sell products and services to other companies will start out naturally focusing on sales. Sales provide a direct relationship between the company and the business customers. It is only once the company gets to a particular size, either revenue or sales team size that a decision will be made to build a marketing function to support the sales efforts. This means that the marketing strategy is actually the same as the sales strategy. This superficially makes sense. After all, sales is all about building relationships with customers and therefore who would know the customer better than sales? But here is the thing, technology, specifically marketing technology such as search, social media, websites and the demand by customers for information and content has changed the ways that companies can engage their customers. This approach is known as inbound marketing, naturally as opposed to the traditional strategy, which is known as outbound marketing. 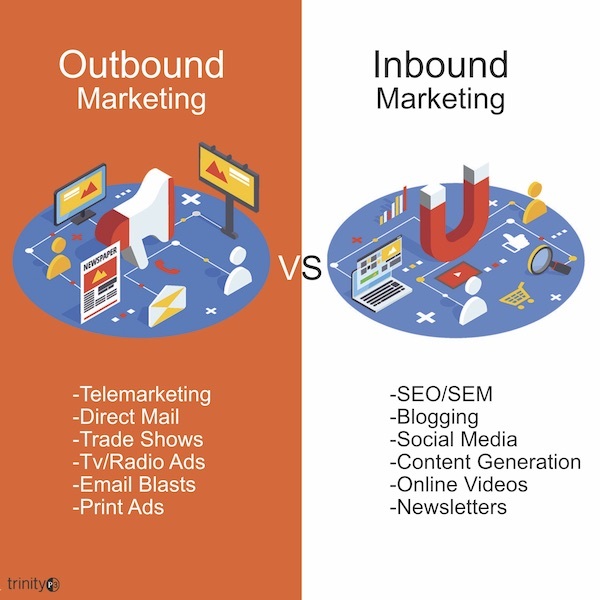 Outbound marketing is the traditional sales support strategy based around finding potential customer and generating leads through advertising, database marketing, trade shows and email. Inbound is about having your potential customer find you through search, blogging and video content, social media and newsletters. In my own experience my company started out with a sales focus and many of our efforts were outbound marketing to create awareness and interest. These were potential leads that needed to be qualified, nurtured and then converted. Our conversion rate was running at a very healthy 30% and consumed significant sales resources to simply feed the sales funnel to get the revenue growth we needed. Then in 2011 after almost a decade of sales driven outbound marketing we changed our strategy and become inbound. This meant focusing on creating content in the form of blog posts, video, podcasts, white papers that we shared through social media and made searchable for our customers and potential customers. In the process we grew traffic to our website by 300% and increased conversion rates to more than 60% as customers were coming to us, prequalifying themselves and finally growing the business 30% in a year. You can read all of the details here. 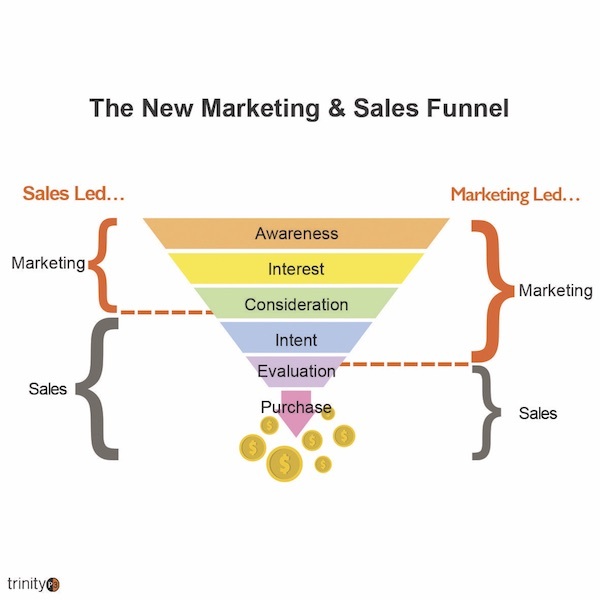 Some call this the new marketing and sales funnel, but in actual fact it is simply a different strategy for B2B companies. It is when you go beyond the results that you start to appreciate the importance of adopting this approach. 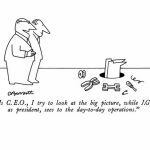 First is the change for the sales team (the company leaders) because the strategy builds your perception with your customers and potential customers. By creating and sharing interesting, informed and compelling content it positions the team as thought leaders in our category. When we meet with customers who have contacted us they feel they know us and what we represent. 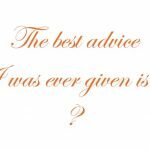 Second, when leads come to us they are often qualified as they have had an opportunity to read, watch and listen to not just what we have to say for ourselves, but what our existing clients have to say and share about the work we do. Third, our reach is global and yet our sales team is not. Inbound marketing means that our customers find us through internet searches, social media and more. We have more visitors to our website each month from the USA than we do from Australia and NZ. We jokingly call ourselves a micro-multinational as we have global reach and business with a team that represents a SME. Since then we have continued to evolve the strategy including adding automated marketing, lead nurturing and database marketing. But the fact is that we can only do this because we have a marketing strategy that is aligned and accountable to our sales and revenue objectives. So what is your B2B strategy? Is it sales and then marketing? Or are you considering a marketing and sales strategy?